Charles Tennyson d'Eyncourt (1784-1861), Politician; MP for Stamford and Lambeth. Sitter in 4 portraits. John Harrison Jr (active 1801-1852), Portrait painter. Artist associated with 10 portraits. 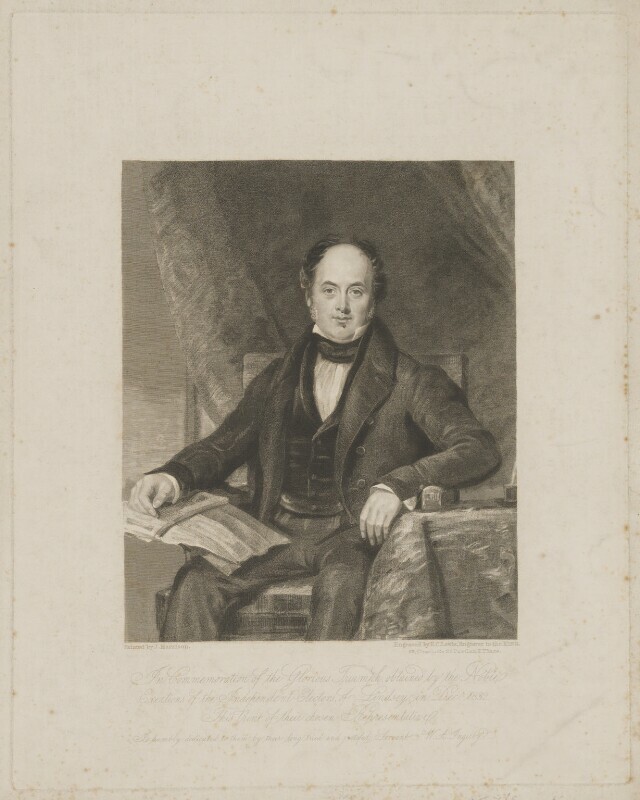 Frederick Christian Lewis Sr (1779-1856), Engraver and landscape painter. Artist associated with 192 portraits, Sitter in 1 portrait. William IV agrees to the creation of new peers in order to obtain the passage of the Reform Act, although this proved unnecessary when the Tories withdrew opposition. Male franchise is extended by fifty percent; fifty-six 'rotten boroughs' lose representation and forty-one new constituencies are created. Irish and Scottish Reform Acts are also passed. Mathematician Charles Babbage publishes his best selling Economy of Machinery and Manufactures. In response to recent outbreaks of machine-breaking and riots, he aimed to reveal the sources of Britain's industrial strength to the urban elite and promote institutional change. Parliament votes funds for National Gallery buildings in Trafalgar Square. Free land grants end for English settlers in Australia on recommendation of the leading colonisation theorist Edward Wakefield in his Letter from Sydney. Greek independence recognised by the Treaty of London.